Back in 2012, I discovered this game called “pit hockey” that was referenced on a couple of sites. No one seemingly could explain what pit hockey was, however, so I was left with a void in terms of knowing what this game was all about. 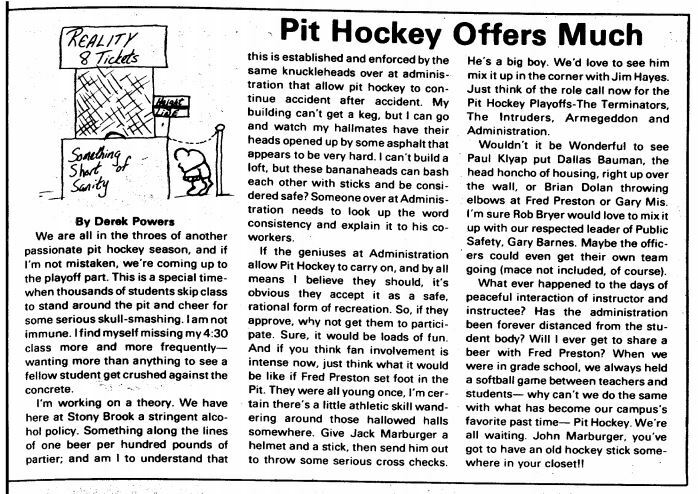 I received an email from reader Seth H. who alerted me that he used to be a pit hockey player! Thanks to Seth’s email, I began walking down the path that pointed to SUNY rather than Stony Brook University. 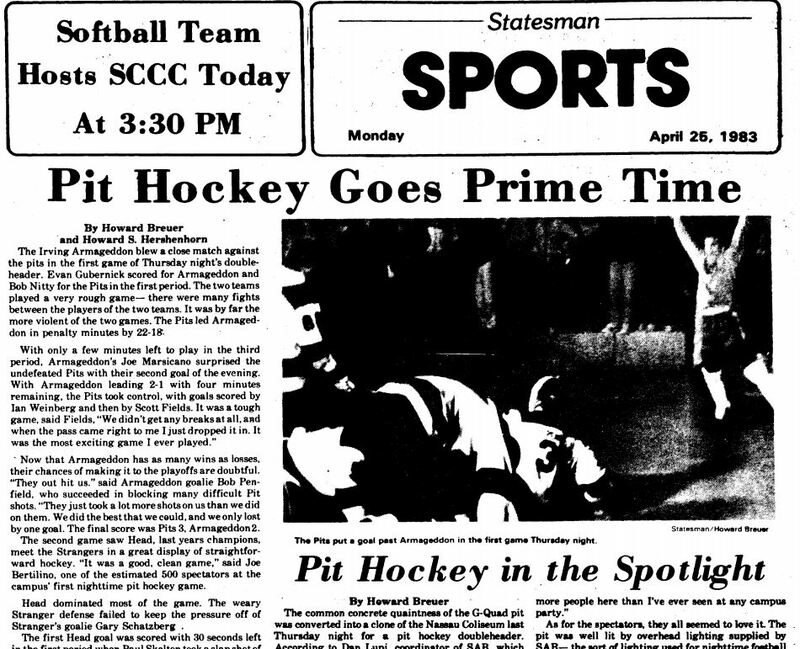 Stony Brook Press, “The University Community’s Weekly”, that Seth linked in his email talked a little about how SUNY ended a great tradition of pit hockey “by planting trees and shrubs throughout the area that was the pit”. 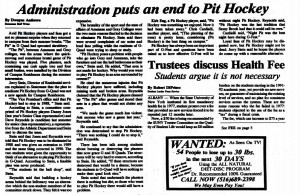 Seth’s 1989 Hamilton team was one of the last to play pit hockey at SUNY! The common concrete quaintness of the G-Quad pit was converted into a clone of the Nassau Coliseum last Thursday night for a pit hockey doubleheader. According to San Lupi, Coordinator of SAB, which sponsored the event, the games were attended by at least 500 students, not including the players. 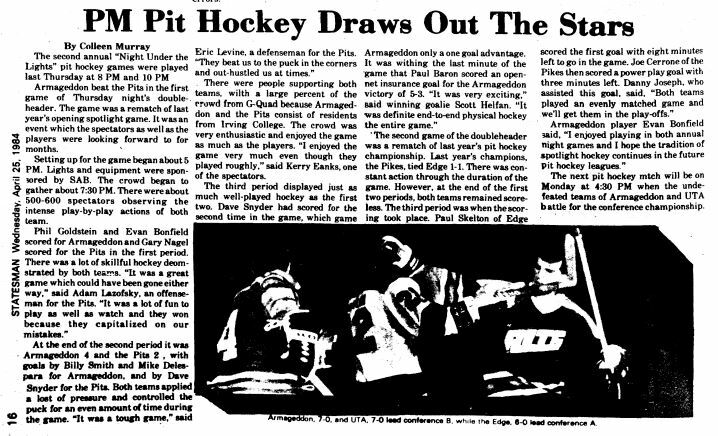 Maybe you’d think that 500 spectators wouldn’t stand up to the attendance at the average Islanders game, but it is a lot considering pit hockey is neither a school nor an intramural sport– it is composed entirely of independent teams from the dorms around campus. Again, the event drew more than five hundred fans to the G-Quad pit, which we all now know as the “Mendy Pit” since G-Quad was renamed. We are all in the throes of another passionate pit hockey season, and if I’m not mistaken, we’re coming up to the playoff part. This is a special time– when thouseands of students skip class to stand aroudn the pit and cheer for some serious skull-smashing. I am not immuune. I find myself missing my 4:30 class more and more frequently– wanting more than anything to see a fellow student get crushed against the concrete. 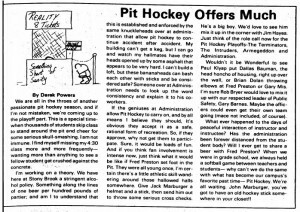 Avid Pit Hockey players and fans got a not so pleasant surprise when they returned to campus from their summer breaks. “The Pit” in G Quad had sprouted shrubbery. 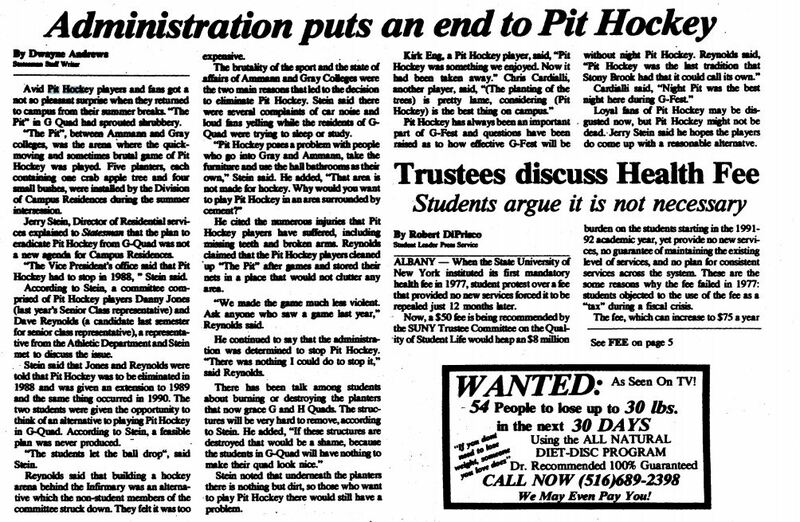 … The brutality of the sport and the state of affairs of Ammann and Gray Colleges were the two main reasons that led to the decision to eliminate Pit Hockey. 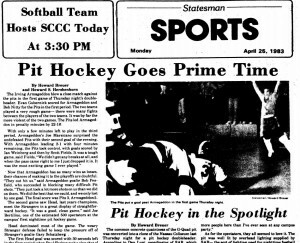 Ice hockey is still very much alive and well with our students, but “pit hockey” certainly holds its own interesting place in our campus’s history. Hey, great article, Chris! I’m going to cross-link back to you for my Friday article. Is that cool? Lemme know! HBIC is loving this!